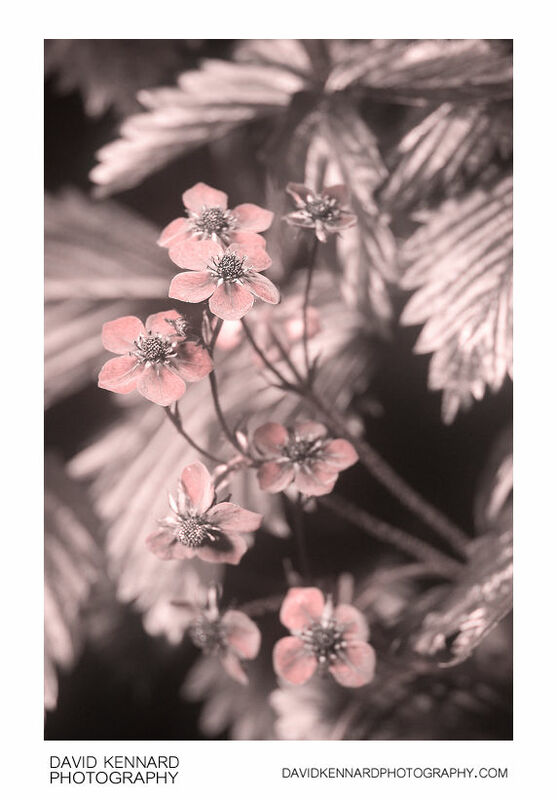 Ultraviolet photograph of a flowering Wild Strawberry (Fragaria vesca). When seen in ultraviolet, the flower petals have dark markings near the base and the centre of the flowers appear quite dark. This contrasts with the flowers' appearance in visible light, where the petals are plain white and the flower centres are quite bright yellow. The hidden UV markings are known as 'nectar guides', as they can be seen by bees and some other insects. This is beneficial to the insects by helping them locate the nectar quickly, and so beneficial to the plant since it relies on the insects for pollination. Pollination is not the Wild Strawberry's only method of propogation though, it also spreads through runners. Seeds are typically only used to spread to new areas, or will lay dormant in the soil seed bank, ready to grow back after an event such as a fire.